Start achieving your health goals when you discover the truth about supplements - control blood sugar, sleep better, boost your brain power, and more. You can make better supplement and nutrition decisions. You just need to know what works and what doesn't. If you've found this page, then you're probably looking to find out the truth about supplements - which work, and which don't. You know that supplements can help, but you don't know who to trust. Everywhere you turn, you're overwhelmed with companies promising you the latest and the greatest. For the past five and a half years, we've been trudging through thousands and thousands of peer-reviewed scientific studies so that we can thoroughly understand supplements. The goal is to give you a resource that takes the confusion out of what supplements are worth investing in. Before we go any further, it's important to note: we are NOT here to sell you supplements. We don't own a line of supplements that we will steer you towards. We're not in cahoots with anyone that does. In fact, we make NO brand recommendations. We make NO product recommendations. All we do is make sense of scientific research on supplementation and nutrition. So you can achieve your health goals faster without the hype or the misinformation. Let's be honest. Supplements are a billion dollar industry. It's an industry built on big promises, great packaging, and fantastic marketing. You can find supplement companies listed in public stock exchanges all over the world, some of them worth billions on their own! Take glutamine for example, an amino acid that is sold as a muscle builder. Did you know that it only builds muscle tissue... in petri-dishes? Or for those with severe burns? And did you know that glutamine is big business, generating over $600,000,000 a year in business? But for the average gym-goer, glutamine is useless. Examples like the one above are why we created this guide. So you can separate fact from fiction. Get to the truth. Rely on people you can trust. And get access to information at your fingertips that will help you save money. No more buying supplements that don't work or live up to their promises. Take the guesswork out of which supplements fit your needs. Sifting through a laundry list of supplements isn't a very effective way to determine which ones will improve your health. That's why we've included over 400 health goals cross-referenced by the supplements commonly used to meet them. Make decisions based on reliable scientific information . One of the things that sets Examine.com apart is our refusal to cherrypick studies. Studies which use rats or cells in petri-dishes can often lead to faulty conclusions. Instead we focus only on randomized double-blind studies with human subjects. Get answers to your supplement questions you don't need a PhD to understand . Wading through the giant body of medical research not only takes time but skill. The A-to-Z Supplement Reference cites primary sources and compares them for you without the science jargon. Because we don't sell supplements ourselves, we'll tell you which supplements are a complete waste of your money. Promise. As a science-trained nutritionist, my entire work must be evidence-based if we are not to be constantly swayed by hyped up marketing claims or people's theories. But keeping abreast of research in every area of nutrition is impossible. When this guide landed in my inbox I was stoked. It is now an invaluable resource for my work. I have at my fingertips the studies to date on a particular supplement, I can click through to read them and I can see in one glance the conclusions that can be drawn. For anyone using or advising on supplement use, I cannot recommend this guide highly enough. Examine.com is the most diligent and comprehensive resource for science-based supplement information, bar none. I refer students and colleagues to the site regularly, and I use it myself. Examine.com has become THE repository resource for nutritional supplement information. Most other similar databases fail at what they're good at, which is being accessible and being comprehensive. Their frequent updates stay on top of the literature as it evolves. Examine.com gives me an excellent overview of the body of work, which helps me filter and refine my search strategy when I'm looking up supplements that I get asked about that I've never heard of. The Human Effect Matrix provides interpretation that is lacking in every other supplement database in the world. Most people don't have the time or interest to develop high-level expertise, but need somewhere to turn to to make informed decisions about their supplements. That information is at Examine.com. It's insufficient to simply rely on belief, conjecture or internet advice to determine if supplements are right for you. Instead you need to rely on research. With Examine.com's A-to-Z Supplement Reference not only will you find their summary of the research, but also links to the original papers should you want to do your own due diligence. Truly a massive and helpful undertaking. 300+ Supplements We cover everything from 5-HTP and Aloe Vera all the way to Whey Protein and Zinc. We even document supplements you may not have heard of, from 1,3-Dimethylamylamine (also known as DMAA) to Valerian. If you can supplement it, we have it covered. 400+ Health Goals You want to live a healthier life, and we will help you get there. From anxiety to depression and appetite to inflammation, find out which supplements can help you (and which may hinder you) move toward your goals. 5,000+ human studies We've excluded animal and petri-dish studies, and only list ones conducted on real people. Plus you'll get the Human Effect Matrix - an easy to read chart that spells out the science behind each supplement. Simply search and click on whatever supplement or health goal you're interested in. Instantly, find supplements that work. When you purchase the A-to-Z Supplement Reference you will also get a lifetime of future updates. As soon as new research is evaluated, a revised copy of your A-to-Z Supplement Reference will be sent to your email inbox - ensuring you stay up-to-date. This single-minded dedication to providing well researched and unbiased information has earned us the title of the #1 site when it comes to supplement information.Over 30,000 visitors trustour research and visit us every day.Over 35,000 health and fitness professionalsuse our A-to-Z Supplement Reference and if that weren't enough to prove our commitment to neutrality, since 2011 we have been featured on a number of the biggest online and print publications in the world including The Huffington Post, Men's Health, and The Guardian. Examine.com is trusted and for good reason. Once you choose to get the guide, you’re sent to the Examine website where you’ll be able to immediately download the ebook in a PDF format and set up your account. Everyday at 5am EST, our internal systems update the guide with any new data. Re-download the guide at anytime for the most up to date version. All of the updates are FREE. You will not be charged again to access your account or re-download the guide. You'll notice that we are not offering free bonuses, special reports, or anything else written by us or even random authors you've never heard of before. There's a simple reason - you don't need that junk. We firmly believe that the A-to-Z Supplement Reference is a vital resource. We don't need to entice you with extra perks or other marketing techniques. We're putting our names on the line, and that's because we're confident that not only will you find it extremely useful, there's nothing else like this out there. There's a reason why we are the most respected name in supplementation and nutrition. We guarantee that you will find the A-to-Z Supplement Reference useful over the next 30 days. If for some reason you want a refund, simply tell us and we will send you a prompt refund, no questions asked. If you’re serious about your health or have clients you know can benefit from science backed recommendations about supplements, you need this guide. With Examine.com’s A-to-Z Supplement Reference, never again will you need to worry about knowing whether the claims of the billion dollar supplement industry are true or false. You’ll have the truth right at your fingertips. Use this encyclopedic resource as your go-to-guide and you’ll never have to waste time searching google and wondering whether what you found is evidence or (biased) advertisement, you won’t have to waste your money or risk your health on personal trial and error, and you won’t even have to sort through the real research (pub med) because the guys at Examine have spent years doing it for you. Maybe the best part is that, finally the evidence-based trustworthy information we need is all in one place, and is smartly organized so you can find the answers you need in just minutes. Whether you’re a consumer or a fitness pro, this is a no-brainer must-have for your library. The Examine.com site and comprehensive A-to-Z Supplement Reference are both fantastic achievements for which both Kurtis Frank and Sol Orwell should be commended. When it comes to unbiased and reliable, evidence-based information on dietary supplements, applied nutrition and a wide array of health goals, their online database and reference guide are second-to-none. There is literally no other site that I am aware of like it. Beyond the expansive, thorough and comprehensive nature of their reviews, it is well organized with good interpretations of the available data. It's easy to see how valuable this resource will continue to be to me and many of my colleagues. I can highly endorse it without reservation. I recently discovered Examine.com and now realize I found what I was missing in my clinical practice – the authoritative, unbiased, noncommercial reference for supplements. 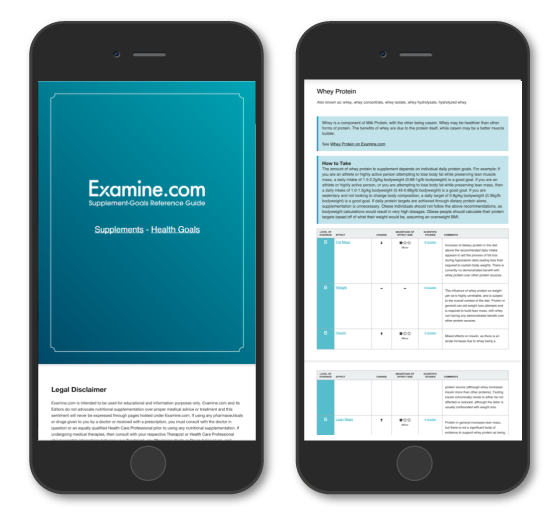 Examine.com simplifies the complex world of nutritional supplements into one easy-to-use guide that is constantly updated with the latest research. No healthcare provider or person serious about their health should be without it. I have used Natural Standard in the past which costs 400 dollars per year. I have since switched to Examine.com for my supplement information as it's the best. Is this a one-time fee or do I pay every month? One time. This isn't one of those recurring scams the other guys run. You pay us once, you get lifetime access. 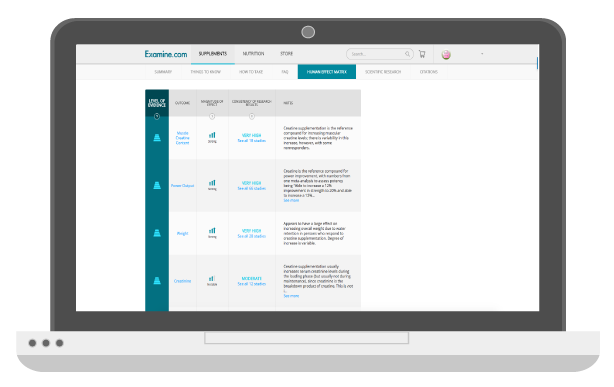 As long as we're updating Examine.com, you have the latest information at your fingertips. Does this come in a physical book? At almost 800 pages, a physical copy of the Supplement-Goals Reference Guide would be big. The PDF lets you quickly and easily access supplement information wherever you are. Even without Internet-access. How does this differ from the main website? It's extremely easy to use. Everything is there, right at your fingertips. Search, find what you're looking for, and done. It will take you less than 5 seconds. It's offline. No matter where you are - in a classroom, in a store, wherever - you have the information available to you. It helps you unlock Health Goals. This is big. The website only focuses on Supplements and what their Health Goals are. 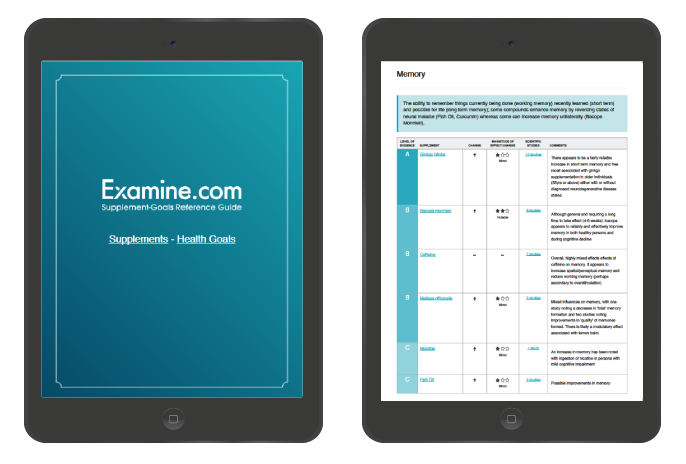 The Supplement-Goals Reference Guide lets you find supplements based on your health goals. Utilize supplementation for better health, a better body, and a better life!